Almost every civilized community and culture has its own heroes, for whom, annual memorial gatherings are arranged, so as to remember and honor them. The style of such memorials varies from culture to culture, but the substance remains identical: The highlights of the hero’s life are reenacted, and the community undertakes to keep alive the ideals for which these heroes gave their lives. For instance, we, here in the States, observe Memorial Day every year in honor of those who have sacrificed their lives in service of America. By the same token, our nation observes Martin Luther King’s Day annually, to remember him and to keep his legacy alive. The main objective behind such a tradition is for us all to undertake to emulate these heroes whenever the need for it arises. Similarly, we, Muslims, remember our heroes who, at one time or another, gave their lives in defense of humanity in general, and their religion in particular. 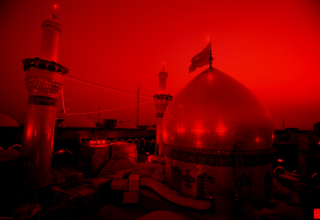 Although such memorial services are organized on several occasions in the course of the year, the first 10 days of the first month of the Muslim calendar year, called Muharram, are specifically earmarked as days of remembrance, generally for all martyrs of Islam, and particularly, for the martyrs of Karbala.. Then, Muslims, of all ages and genders, with affinity to their Prophet , Muhammad, peace be upon him and his pure progeny, meet regularly to discuss their religious rights and obligations, and to mourn for their heroes, who at various times and places in history, were oppressed and killed in defense of these rights and obligations. One such great Muslim hero whose exemplary life and heroic death have become the cornerstone of such memorials, is Imam Husayn, the beloved grandson of Prophet Muhammad, peace be upon him and his progeny. It is the wilderness is of resoluteness, of woe and gall. Imam Husayn’s greatest test, referred to in the above text by Malihabadi, came in the 57th year of his life in A.D 680. The Caliph of the Muslim Empire at the time, Yazid, in his evil desire to destroy Islam and all the virtues that it stood for, turned to the Imam, demanding from him the oath of allegiance. To endorse Yazid, both as the spiritual and secular leader of all the Muslims and Non-Muslims alike in the Islamic world, was to condemn to death humanity in general, and Islam in particular. For Yazid was evil incarnate; he openly flouted human decency. His lust and lasciviousness knew no bounds; his own mother and daughter were not spared from his carnal desires. In the words of Justice Syed Ameer Ali,Yazid was “As cruel and treacherous as Muawiyah…His depraved nature knew no pity or justice. He killed and tortured for the pleasure he derived from human suffering. Addicted to the grossest of vices, his boon companions were the most abandoned of both sexes.” (2) On the other hand, Imam Husayn incorporated “all the ideals which a true Muslim should possess…bravery and manliness…the dedication to the acknowledgment of God’s Absolute Unity…thus (he was) the model for all generations of Muslims…” (3) Given this fact, if the Imam was to endorse Yezid as the legitimate representative and successor of the Prophet, his material possession would improve tremendously; Yazid, the most powerful ruler of his time, would become his ally. But by so doing, he would be sending out a wrong and deadly message to the community. If a man of his spiritual status found Yazid competent enough to be the representative of Prophet Muhammad, peace be upon him and his progeny, then, what else could be expected of ordinary Muslims, but for them to follow suit and recognize Yazid as the caliph and successor of the Prophet? Henceforth, Yazid would set the standard for the code of conduct for the inhabitants of his Empire. Yazid being what he was, vice would become virtue and virtue would become vice! 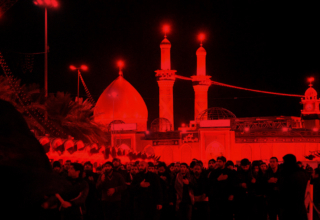 Imam Husayn, therefore, decided not to give his fealty to Yazid. For this, the Imam had to pay a very high price. He was driven from his home in Medina to the scorching deserts of Iraq at a place called Karbala. He and his family, together with a small group of his friends numbering 72 in all, were besieged by an army of not less than 30,000 soldiers. The Imam and his followers were mercilessly put to death, having first been denied water and food for three continuous days. 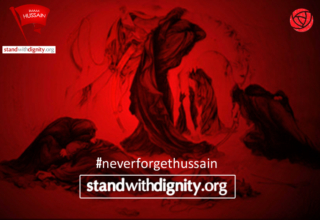 This martyrdom took place on the tenth day of the month of Muharram called, Ashura. 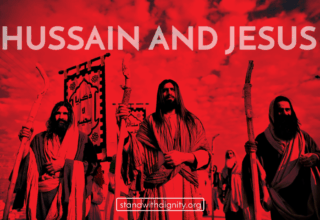 Not being content with the murder of the Imam and his supporters, the army of Yazid imprisoned Imam Husayn’s surviving sick son, Ali, and the women folk and the children who had accompanied the Imam, and sent them to Damascus, some 700 miles away, on the barren backs of camels. They were set free from humiliating captivity after one year, only when they had become a potential source of danger for Yazid, by exposing his vicious agenda against the family of the Prophet. From the articles of Hilal Naqvi, appearing in Afkar Ba Ya’ad-Josh under the heading ‘Josh aur Urdu marsia’, pg. 106-112, Karachi, 1982. 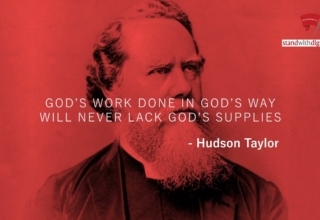 Reprinted in the ‘Light’ magazine, vol. 27, No. 6, December 1993. Saed Amer Ali, “Spirit of Islam”, pg.300, 1981 ed., New Delhi. Prof. M. Ayub, ‘The Excellences of the Imam Husayn in Sunni Hadith Traditions’, pg. 67. Papers from Imam Husayn Conference, London, July 1984. Josh Malihabadi , ‘The Light’ magazine, Dec. 1993 . Edward Gibbon, ‘Decline and Fall of the Roman Empire’, London, 1911, vol. 5,pg. 391-392.